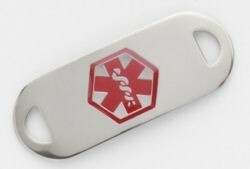 This medical ID tag is blank and features a color of your choice medical caduceus emblem. The tag is 1½ inches long and ½ inch high with the international medical symbol embedded in the top of the tag. The stainless steel medical ID tag is pounded smooth so that it's light weight and easy to wear. This medical ID tag comes blank with a set of temporary medical condition stickers. The stickers can be placed on the back of the tag as a quick and easy way to let emergency technicians know of a medical condition.